Globalization and the development drive undertaken by Saudi Arabia since the latter part of the twentieth century have resulted in an unprecedented social transformation that requires reasoned, patient, and purposeful leadership to shepherd it through. As regent during the reign of his late brother King Fahd bin Abdulaziz and monarch since 2005, King Abdullah was keen to harness Saudi Arabian energies and resources in the service of his countrymen. His stewardship, to be sure, did not go unchallenged or uncriticized, and he would have been the first to admit that his rule and reign were hardly bereft of blemish. Even so, on balance he helped make Saudi Arabia a regional oasis of stability, social peace, economic prosperity, and tribal cohesion. HRH King Abdullah bin Abdulaziz Al Sa’ud inspecting progress of the plans and construction of the King Abdullah University of Science and Technology (KAUST). Photo by KAUST. Believing that the future of the kingdom depended on a population educated to a greater extent than it already was, the king established in 2005 the King Abdullah Scholarship Program that currently sponsors the education of over 100,000 Saudi Arabian students in the United States alone. In the aggregate, in 2013 Saudi Arabia spent about US$70 billion on education, a staggering 25 percent of government spending, or 10 percent of its GDP. Inside the kingdom, and recognizing the importance of an indigenous science education for Saudi Arabia’s economic diversification, the late king in 2009 established the world-renowned King Abdullah University for Science and Technology (KAUST). The university is a co-educational higher education institution that draws on the expertise and knowledge of local and internationally-renowned educators. Saudi Arabians from all walks of life are eligible to enroll, with forty per cent of the seats reserved for citizens, the majority coming from all over the world, and male and female students attending classes and studying together in a modest departure from traditional norms. Among King Abdullah’s most lasting reforms, not without criticism from many corners, are those that have advanced the position of women in Saudi Arabia. This writer can attest to this accomplishment from having returned only in the past two weeks from a visit to the kingdom. During that period I met with women who serve in the Majlis ash-Shura (National Consultative Council), as president of one of the country’s leading universities, president of another local university, editor-in-chief of one of the country’s largest circulation English language newspapers, and head of one of the country’s most avante garde private K-12 schools, in addition to Saudi Arabian women student participants in the country’s first-ever Model Arab League as a result of a collaboration of several years duration with the National Council on U.S.-Arab Relations. During King Abdullah’s reign, Saudi Arabia also saw women work as attorneys and occupy important administrative positions in the commission that regulates the country’s stock exchange. He appointed 30 women to the Majlis ash-Shura, one-fifth of the total – a proportion comparable to the percentage of women in the United States Senate – and a woman as deputy minister in the current cabinet. HRH King Abdullah bin Abdulaziz Al Sa’ud (R) with then United Nations Secretary General Kofi Anan (L), and Saudi Arabian Ambassador to the United States and Foreign Policy Advisor to the King HE Adel A. Al-Jubeir. Photo by United Nations. In addition, for the first time, and following a royal decree enacted by King Abdullah in 2011, women will be allowed to vote and stand as candidates in municipal elections in 2015. Foreign critics are wont to ridicule such a breakthrough as being overly long in coming and, at the end of the day, of little import in terms of the weighty issues that government officials, whether elected or appointed, are entrusted to address on behalf of their constituents. Not so, in the minds of the women who intend to vote and run for office. As anyone involved in municipal affairs can attest, the adage that all politics is local is never truer than it is where positions, policies, rules, and regulations – with regard to education, housing, welfare, electricity, water, parks, the environment, and much else – are adopted and affect virtually every citizen. In 2012, in another first, Abdullah broke with the traditions of his more conservative predecessors when he enabled two Saudi Arabian women to participate in the London Olympics. In charting a course for including women in public life, the king was careful to ensure that his reforms were gradual but purposeful in a delicate balancing act that preserved both the dignity of families and individuals alike together with the norms to which Saudi Arabians are accustomed. King Abdullah acted with mixed success to address issues of social equity in Saudi Arabian society. In 2011, he announced royal decrees to spend over US$130 billion on social programs, employment schemes, housing, salary increases, medical coverage, and social insurance plans. While the appropriations included all sectors of Saudi Arabian society, he was especially keen to address the concerns of those youth in the kingdom under the age of 25 who account for about 50 percent of the population. As many administrative officials can attest, he was also a stalwart against corruption – at any and all levels of government from before serving as the Heir Apparent (Crown Prince) from 1982 straight through to his becoming head of state in 2005. For more than fifty years, King Abdullah was tasked with national security responsibilities that few other leaders have had to address – he was charged with administering the domestic safety requirements of a citizenry living within thirteen borders, making the kingdom in many ways more a continent than a country. King Abdullah’s coming to the position of Custodian of the Two Holy Mosques in 2005 came at a time domestically when Saudi Arabia had become the target of attacks by a local version of al-Qaeda that perpetrated acts of terrorism on the country’s soil. As Crown Prince and leader of the Saudi Arabian National Guard, Abdullah led the state’s security institutions in an effort to re-establish order and stanch the sources of extremism and militancy. By 2006, the country had largely rid itself of the scourge of terrorism, and had begun to offer security assistance to unstable Yemen and support for marginalized Sunni Arabs in post-invasion Iraq. In 2008, King Abdullah was able to harness his country’s wealth, position, and prestige to improve the international economic order after the global financial crisis that year. Both as a country with a GDP then approaching the trillion dollar mark and a leader among similarly endowed GCC countries, Saudi Arabia under his leadership was a driving force in the establishment of the Group of 20 – comprised of the world’s strongest economies – to give voice to those nations that had until then not been treated as important contributors to the world’s material wellbeing. Close to home, King Abdullah worked hard to try to transform the Gulf Cooperation Council (GCC) into a stronger and more effective organization than when he found it. For example, he worked tirelessly to advance the prospects for an eventual monetary and customs union, a more open and robust pan-GCC market, and, more boldly still, an actual and strong political union which he proposed at the 2011 Summit Meeting of the Supreme Council of the GCC in Riyadh. 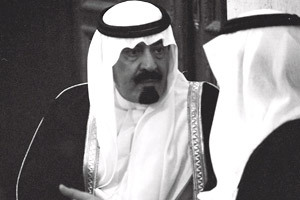 Then-Crown Prince Abdullah at a GCC summit in the 1980s. Photo by Dr. John Duke Anthony. In 2011 also, and working in accordance with a liberal interpretation of the GCC charter, he ordered Saudi Arabian security forces into Bahrain to help secure the latter kingdom’s strategic installations after street protests threatened social peace and state control. A modest step toward an eventual GCC military union, which he believed would help strengthen the alliance, was recently announced at the 35th Supreme Council Summit in Doha, Qatar, when the GCC leaders announced the establishment of a Joint Military Command. King Abdullah was also instrumental in the establishment of a Riyadh-based institution where producing and consuming country representatives could cooperate regularly on issues of concern to both. To that end, he provided financing for the front-end design, engineering, materials procurement, and construction of the institution’s headquarters. King Abdullah never tired of seeking to advance the inalienable right of Palestinians to a state of their own, without which he believed that the Palestinian-Israeli conflict would continue to be the greatest source of instability in the Arab world and the Middle East. On March 31, 2002, he advanced the most bold, far-reaching, and comprehensive peace initiative ever offered Israel. The initiative was adopted unanimously by the Arab States Summit in Beirut that year and has subsequently been renewed, again unanimously, by all 22 members of the League of Arab States. The plan calls for an Israeli withdrawal from all occupied Arab territories, the establishment of a Palestinian state with East Jerusalem as its capital, a reasonable settlement of the Palestinian refugee problem in accordance with 1948 UN General Assembly Resolution 194, and full recognition of Israel by all Arab countries. While the world continues to await a positive response by the State of Israel thirteen years after the proposal was made, the initiative arguably remains the most reasonable and equitable peace plan ever offered Israel for resolving the Arab-Israeli conflict. Externally, Saudi Arabia on King Abdullah’s watch faced numerous challenges of a different nature. When the United States invaded Afghanistan in 2001, it did so to topple the Taliban regime that was seen by Washington as sheltering the al-Qaeda organization that had perpetrated the September 11, 2001, attacks against American cities and installations. That American forces also invaded Iraq and toppled the regime of President Saddam Hussein in 2003 ushered in no end of negative consequences of immense concern to Abdullah. The two military actions introduced unwarranted strategic and security repercussions that threatened the kingdom’s domestic and external security. In both instances, Crown Prince, and later-King Abdullah counseled caution but worked hard to ameliorate the excessive and continuing damage that was especially obvious and prescient in the Iraqi case. Crown Prince, and later-King Abdullah counseled caution but worked hard to ameliorate the excessive and continuing damage that was especially obvious and prescient in the Iraqi case. Overthrowing Saddam Hussein was not what worried Saudi Arabia or its leadership. Instead, the kingdom and its partners in the Gulf Cooperation Council cautioned the Bush Administration about military action against Iraq in part because they considered it the keeper of the Arab world’s eastern gate against Iran. In addition, they were concerned that the American government, having not had diplomatic relations with Iraq for most of the years since the June 1967 Arab-Israeli War, was bereft of the requisite empirical expertise, contacts, knowledge, and understanding of the country’s evolving inner political dynamics to administer it effectively after the invasion and occupation commenced. Of greatest concern was that Washington underestimated the nature and the extent to which Iran would take advantage of the ensuing chaos that Riyadh and most of the other GCC country leaders were certain would occur. As years of American occupation and pro-Iranian politics in Baghdad have shown, Washington officialdom’s failure to heed Saudi Arabia’s cautionary advice came at an exceptionally heavy price. Even so, King Abdullah recently ordered the re-opening of the Saudi Arabian embassy in Baghdad to help salvage what relations remain between Iraq and its Sunni Arab cousins. As for neighboring Iran, King Abdullah cautioned repeatedly against the Islamic Republic’s interference in Gulf and Arab affairs. From his many positions of authority since the start of the Iranian Revolution in 1979, he was witness to Iran’s indirect attempts to de-stabilize Bahrain for decades on end; its success in creating and helping to strengthen, sustain, and expand the power and influence of Hezbollah in Lebanon in the same period; its implicitly threatening naval maneuvers in the Gulf; its sponsorship of sectarian parties in Iraq; its contributions, if mainly rhetorical and political, to the destabilization of Yemen through its voiced support of the Shia Houthi rebels; and, within recent weeks, the boasting by Iranian officials that the Islamic Republic has emerged not only as a major regional power and player in its own right, but has gone from strength to strength, as it were, in light of its self-stated “major influence” in four Arab capitals: Baghdad, Beirut, Damascus, and Sana’a – heady stuff to be sure, the likes of which would, under any circumstances, be certain to rile the sensibilities of any proud Sunni Arab leader. Importantly, King Abdullah saw the carnage that besets Syria as one of the clearest examples of Iran’s designs in the Arab world. As that country approaches the close of its fourth year of civil war, 200,000 have been killed, millions have been maimed, and ten million Syrians – approaching half the population – have been made refugees and internally displaced persons. At the same time, while remaining vigilant regarding Iranian designs, he saw the efficacy of maintaining diplomatic relations with the Islamic Republic. Accordingly, he frequently sent reconciliation messages to Iranian authorities cautioning against the rise of Sunni-Shiite sectarian tensions in the Gulf and the wider region. As was the case with those he succeeded, King Abdullah led not just any country but one like no other that – for 1.6 billion Muslims, a quarter of humanity – is the epicenter of prayer and pilgrimage, and of faith and spiritual devotion. King Abdullah all his life was a believer in Arab and Muslim solidarity, and devoutly served as Custodian of the Two Holy Mosques. The annual Muslim hajj (pilgrimage) brought at least two million pilgrims to Mecca in arguably the largest annual religious meeting in the world. Saudi Arabia during his reign was also a large contributor to charity and humanitarian assistance around the world, but especially to the disenfranchised and homeless Palestinian and Syrian refugees. King Abdullah was not only keenly aware of the global misunderstanding and misinformation about Islam and its position vis-à-vis other world religions and faith-based beliefs and institutions. He put his weight behind the forging of a World Dialogues Center in Vienna, Austria. In that spirit what he accomplished was a matter of no small moment. More than any other contemporary Muslim leader, he provided a tangible means for representatives of the three monotheistic faiths and other leading world religions to search for, emphasize, and find ways to practice the common ground among them. King Abdullah was not content to condemn acts of terrorism in the name of Islam or any other ideology or cause, although he did that. In 2014 he spearheaded Saudi Arabia’s contribution of US$100 million to establish a United Nations center whose sole purpose is to address the challenges, causes, and manifestations of extremist acts of violence. President Barack Obama with HRH King Abdullah bin Abdulaziz Al Sa’ud, when the former visited the latter in June 2009. Photo by U.S. Embassy in Riyadh. 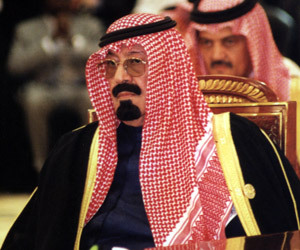 In relations with the United States, Saudi Arabia during King Abdullah’s rule proved to be America’s staunchest ally among the Arab countries, the Middle East, and the Islamic world. On his watch political, economic, social, and military relations witnessed deepened coordination and collaboration. Since 2005, Saudi Arabia has purchased no less than US$100 billion of American military hardware. In 2014, the kingdom became the United States’ premier Middle Eastern and Arab partner in the coalition to fight the so-called Islamic State. Accordingly its air force has flown missions over Iraq and Syria in pursuit of the organization’s fighters. At the helm of Saudi Arabia’s political system since 2005, King Abdullah led the kingdom with a steady and firm hand. He helped advance it to a position of unprecedented international prominence. During his reign the country benefitted from its continued national sovereignty, political independence, and territorial integrity plus twice that again in the form of political stability, social peace, and economic prosperity, a triad of essential factors of vital importance for the country’s future. While he will be sorely missed, newly-sworn-in King Salman bin Abdulaziz and Crown Prince Muqrin bin Abdulaziz are almost certain to continue his legacy. Under them, Saudi Arabia, in its relationship with the United States, now eighty years on and counting, shows every indication of continuing to serve as a strong friend and ally, a reliable strategic partner, a beacon for moderation, and retaining a position of influence and leadership in a region of indisputable vital importance to the Saudi Arabian people, its fellow GCC and League of Arab States and Organization of the Islamic Conference members, the Great Powers in general, the United States and its allies in particular, and virtually every other region of the world. This entry was posted in John Duke Anthony, King Abdullah bin Abdulaziz Al Saud, Saudi Arabia.